For the younger NHL fantasy hockey pool player, many of the daily fantasy hockey sites that offer online leagues for NHL playoffs have the standard Salary Cap games or a few even offer a Snake Draft NHL game for the NHL playoffs, but some old school NHL hockey fantasy players who participated in NHL office pools in the past may find those games too technically challenging or complicated. Fear not old-school NHL fan, because the Pro Pick’Em game offered by Fantasy Feud is right up your alley! For hockey pool veterans, before the internet was invented, Pro Pick’Em games were how some fantasy hockey pools were run in local newspapers or in office pools. In Pro Pick’Em or a “box pool”, you simply build a roster of 10 fantasy players by choosing 1 player from each box. Each group has 8 players to choose from and all the players are similar in fantasy points per game. For the NHL fantasy hockey pools, goalies are in a group together, defensemen are in a fantasy group, top stars are in a group and so on. There are no player fantasy salary caps to calculate through, no drafts to rank players in, you simply pick the NHL player from each group who you think will have the most points that night or that week and you are done. It’s the least time intensive fantasy hockey league. 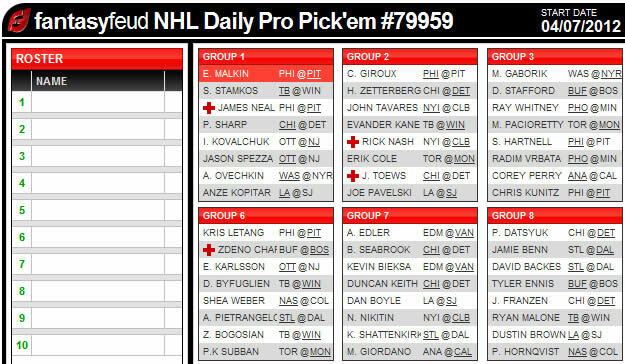 If you’re looking to play in a fantasy hockey league tonight and you are pressed against the deadline to make picks, Pro Pick'Em is for you. For organizers looking to set up an NHL playoffs office pool online, Pro Pick’Em from Fantasy Feud is a great option because you can have everyone sign up individually, they can put in their own money, and you can create a private league for only your NHL office pool members to join. When you are looking for where to play fantasy NHL hockey online, the Pro Pick’Em game is a hit with players of all ages and all sexes. If you are an organizer of NHL playoff pools this year and you are looking at setting one up online, the Pro Pick’Em game will entice older fantasy players from your office that may be skeptical to join not knowing all the rules – this is the same NHL playoff pool that you have run for years with pen and paper, only now it can be played easier online.